For your yet unwritten ballads or romantic soundtracks. Unlike in popular music, where we tend to cram as much as we can into a minute and a half and then repeat it, music for television and the silver screen is designed to emphasize a narrative – add tension, suspense and context. It has little or no boundaries other than that it needs to act as one coherent voice together with the images to convey a story. 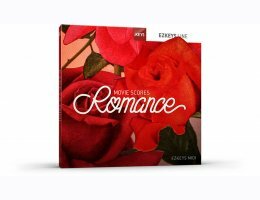 This collection of EZkeys MIDI was inspired by a wide range of soundtracks used in films of the "romance" category. But in many ways, this EZkeys pack goes beyond the realm of scores or soundtracks and instead paints a richly detailed musical framework for anything that falls in the ballad or "romantic" niche. Just as it can be used by any writer of commercial tracks for TV or film, it works just as well for ideas for your yet unwritten ballads. Expect anything from dreamy to wide awake, happy to melancholic and dark to light – all with that unmistakable "movie-like" twist to it. Toontrack said it before: On the silver screen, music is more than just chords and melody – it’s a storyteller. Start writing!